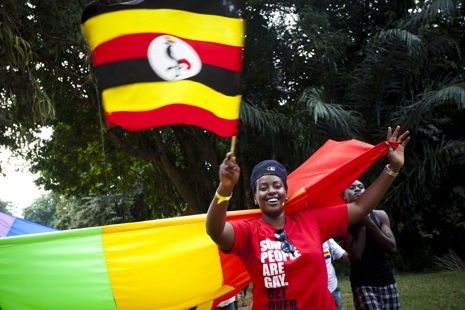 Gay And Proud In Uganda - Joe.My.God. “Can you imagine that the worst place in the world to be gay is having Gay Pride?” Kasha Jacqueline Nabagesera asked a crowd of cheering gay men, lesbians, transgendered men and women, and queers somewhere in between. It was Saturday afternoon, and we were on the shores of the giant, cloudy Lake Victoria in the Ugandan city of Entebbe, where L.G.B.T. activists had decided to stage the country’s first Pride Parade. Nabagesera, a lesbian activist covered, for the occasion, in glitter and neon spray paint, with homemade angel wings, was being half-sarcastic. A barrage of media coverage has painted the country as a hell for gays—a place where they are suffering and being attacked constantly—and, despite the need to combat such threats, L.G.B.T. Ugandans were tired of hearing a story that ignored their nuanced experiences of both joy and hardship. Next Obama Hasn’t Even Been To Israel!